The McDonald Distinguished Scholar Lecture Series on Christian Scholarship, a five-year series that brought together scholars from the U.S. and Europe for robust discussions on matters ranging from human rights to flourishing, concluded with a conference on religious freedom. "Is Religious Freedom Under Threat? 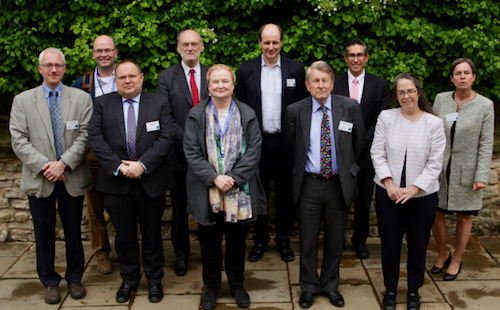 A Trans-Atlantic Dialogue" was held at Christ College May 24 and 25 and co-hosted by the McDonald Centre and the Center for the Study of Law and Religion. The McDonald Agape Foundation funded the conference. Other speakers hailed from Oxford, Warwick, Bristol, Cardiff, Emory, Harvard, Notre Dame, and Baylor universities. Robert W. Woodruff Professor of Law and CSLR Director John Witte Jr. lectured with Mark Hill, QC on "Historical Hinterlands: United Kingdom and the United States." Roger Trigg and Francis Beckwith on "Freedom - of Conscious or Religion?" Julian Rivers and Kathleen Brady on "Religious Freedom Versus Equality Law?" Nigel Biggar and Cécile Laborde, FBA, on "Religious Establishment: Can It Be Liberal Enough?" Alonzo McDonald, chairman of the McDonald Agape Foundation, could not attend the conference, but he recorded a welcome message from his Florida home. To view all lectures from the McDonald Distinguished Scholar Lecture Series on Christian Scholarship, go here.